Keep your child engaged for hours with the Whirlygig Rattel Clutching Toy from HABA! 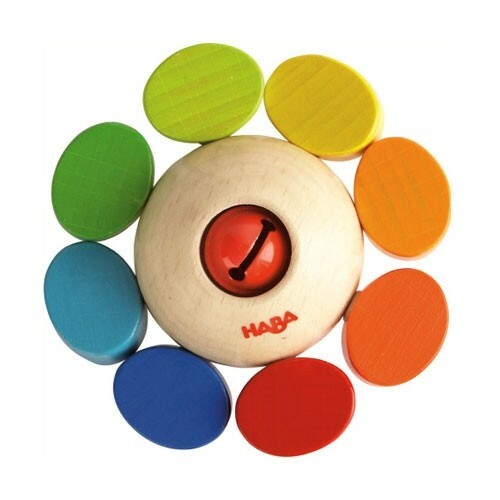 Made in Germany from sustainable beech wood, this innovative toy is both environmentally friendly and durable. The movable wooden elements and little jingling bell are secured with a strong elastic band, expertly designed to help develop clutching and grasping skills. With your child's safety in mind, we only use a non-toxic, water-based stain on our wooden toys to give them the bright, vibrant colors that kids around the world have come to love. Perfect for ages 6 months and up!